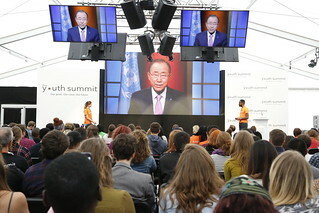 United Nations Secretary General Ban Ki-moon sends a personal message of support to the activists at the Youth Summit. On 12 September 2015 hundreds of young people came together at the #YouthSummit in London to raise their voices about the future of their world. September also sees the largest-ever gathering of world leaders at the United Nations in New York to sign up to new Global Goals that aim to eradicate poverty for good. The Youth Summit gave young people a chance to get their voices heard on the global issues they care about. They have the power, commitment and energy to make sure the world delivers on promises made in New York. This image is posted under a Creative Commons - Attribution Licence, in accordance with the Open Government Licence. You are free to embed, download or otherwise re-use it, as long as you credit the source as 'Jessica Lea/DFID'.